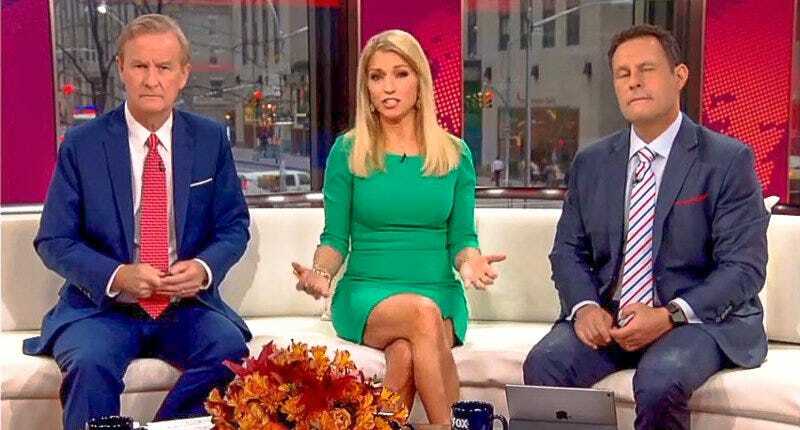 I’m not sure if Fox News host Ainsley Earhardt was attempting to comfort the grieving families of those who lost loved ones in the Texas church massacre over the weekend, or if she were extolling her own faith and preferences, or if she just, as a matter of fact, enjoys shoving her whole entire foot down her mouth. Earhardt expressed Monday that the victims of the First Baptist Church shooting in Sutherland Springs, Texas, had gone to the right place, and were close to God, at the time of their deaths. Because there is a “right” or “preferred” time and place to be brutally killed. But Earhardt wasn’t done yet. Abbott did give a nod to the faith of the victims and that of their loved ones, saying that “their faith in God was unwavering,” as demonstrated by a vigil that he attended. Of course, there is nothing wrong with leaning on one’s faith, if that’s what gets you through crises, but I think in this scenario, just as much as Texas may need prayer, Texas (and the United States in general) also needs legislators who are willing to look at why someone who did not have a license to carry was able to wreak havoc on a place of worship in the first place. How Many (White) People Have to Die Before America Gives a Damn About Its Gun Problem? Trump Says Texas Shooting Is a ‘Mental Health Problem,’ but Was It?